After a deluge of early summer rain my garden has exploded with growth. The vegies look as if they are on steroids and so do the roses. Unfortunately, so do the weeds, which are making a takeover bid for the entire garden. Urgent action is needed to stop them in their tracks. The keys to successful weed control are fast action and persistence. The fast action is needed to get them out of the picture before they set seed while persistence is required to get rid of the original weed and its progeny. For annual weeds, it’s a quick fix. Pull them up before they flower and set seed and they’re gone. Easy-to-remove weeds include flickweed, milk thistle, petty spurge and cleavers but act fast as they move swiftly from flowering to spreading their seeds. For others however, seeds are just one part of the overall survival plan. The eradication of perennial weeds needs long-term commitment from a persistent gardener. 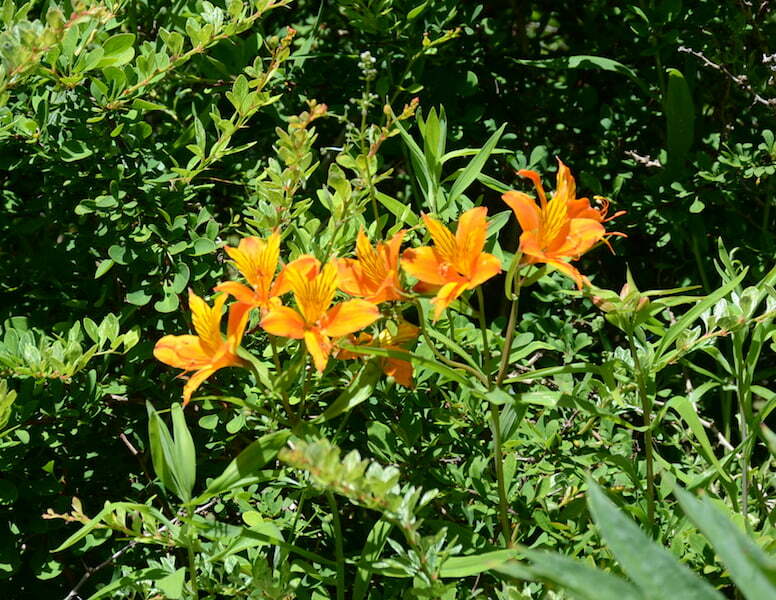 For weeds such as oxalis, onion twitch, a grassy plant that grows from a bulb, and orange alstromeria, which are all feral in this garden, persistence is required often for years. 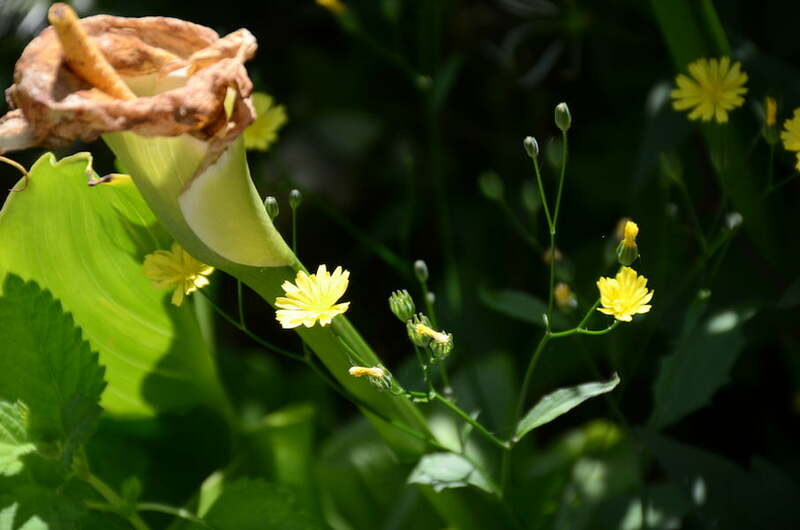 Arum lily and weedy daisy: get rid of weed flowers before they form seed. Getting rid of weeds also requires cunning. The successful gardener needs to think like a weed to understand how they grow. Weeds are opportunists – if they spot a piece of bare earth they’ll grab it, and they’re hard to shift once they’ve moved in. Leaving bare soil invites weeds in, so cover bare patches with mulch or generous plantings. Unfortunately, weeds also like to grow among other plants often growing among the roots of shrubs and going unnoticed until they flower. Most weeds have more than one survival strategy so dispersing seeds is just one angle. The most successful weeds also multiply by reproducing in other ways – such as with underground bulbs or corms or by sending out runners that form new plants. Some also allow their tops to come away leaving their root systems intact to regrow. When persistent weeds are disturbed – for example by desperate gardeners, who are trying to get rid of them – they take the opportunity to spread. While it may be possible to remove the odd small weedy outbreak by carefully digging it out, larger infestations of persistent weeds need a planned campaign for a successful attack. Our garden has been invaded by oxalis. The invasion began long before we arrived so the oxalis was well established by the time it was my turn to deal with it. I’ve tried many strategies including digging out small clumps, excluding light with newspaper and mulch, and finally the ‘lawn’ solution. Digging doesn’t work and oxalis can grow through paper and heavy mulch. The lawn solution has proved to be the most successful strategy to date but it’s a long-term approach. 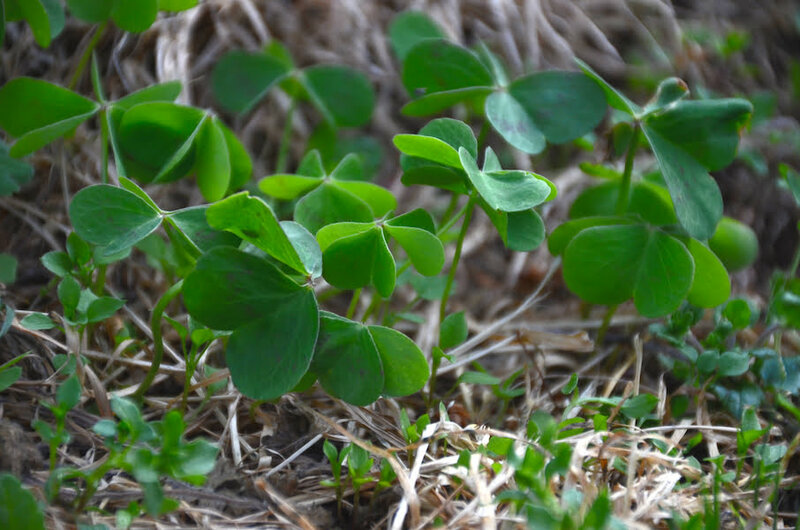 To rid the vegetable garden of oxalis – which grew so lush and tall in the summer that it engulfed the vegetables – I removed the vegie beds, leveled the site and turned the area into lawn. The cunning plan is to keep mowing the lawn and any emerging oxalis to weaken the bulbs and prevent flowering. 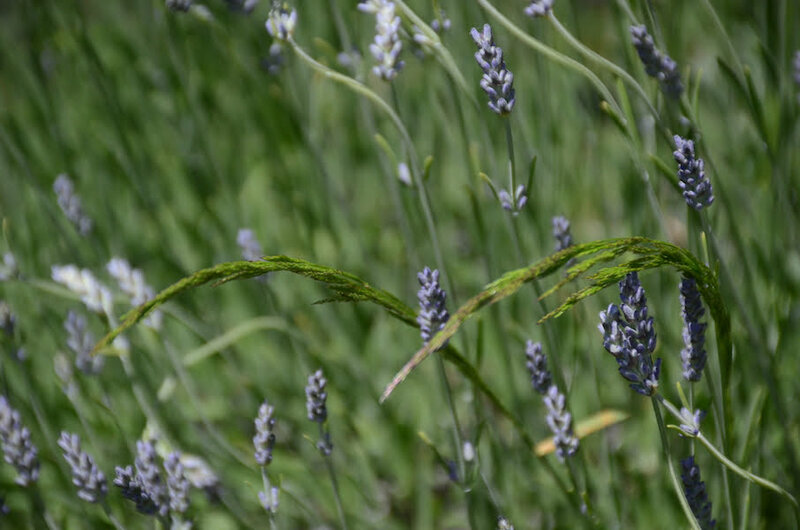 The repeated mowing stops the weed from storing energy in its bulb. By not cultivating the soil, the bulbs are not being disturbed, so they are not spreading and, without flowering, they are also not setting seed. After two years the oxalis has been slow to emerge among the lawn although it has popped up vigorously where there’s no grass. Despite the promising early results, it’ll be a long time before I’ll make a garden bed in that area again. I had the space to move the vegetables to another area. In a smaller garden, they could be grown in raised vegetable beds or pots in the same area, while an eradication project is underway. To keep the oxalis from invading new beds, lay a root barrier before filling the bed with an imported organic garden mix. I have also waged a campaign against tradescantia (formerly called wandering jew). 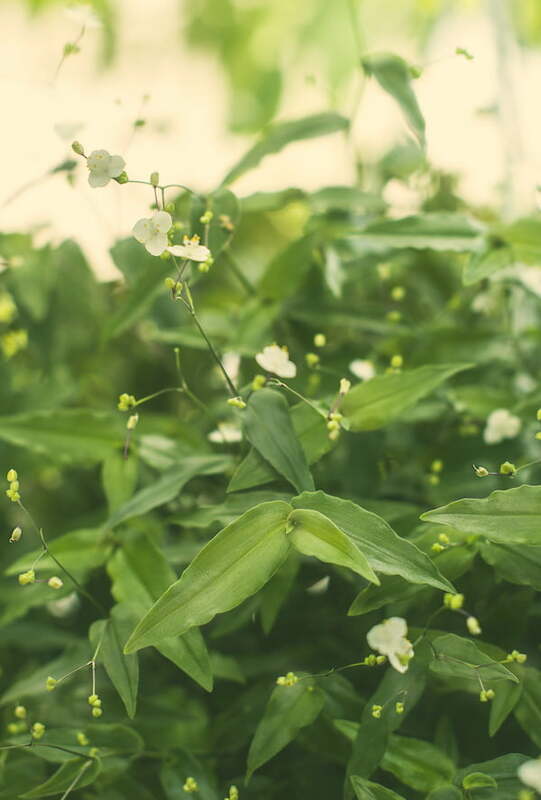 This lush weed known botanically as Tradescantia alba had spread through many shaded parts of the garden, weaving its way under shrubs and around the base of trees. It causes skin irritation in dogs, which was one of the reasons I was keen to eliminate it from my dog-friendly garden. Tradescantia spreads by stems and runners. Even the smallest piece can form a new plant. As it grows it creates a network of rhizomes under mulch and in the top of few centimetres of the soil to fuel regrowth. To remove it permanently it’s important to remove all of the plant including the fine and brittle parts under the soil and mulch. Careful and persistent weeding brings this green nuisance under control but continued follow up is vital. Even three and a half years down the track I regularly spot new outbreaks, which I carefully pull out, put in a bag and place in the garbage bin. The plant is named in honour of plant hunters Englishmen John Tradescant the Elder (1570s-1638) and his son, John Tradescant the Younger (1608-1662), who both collected plants in far-flung places. Magnolias and the tulip tree (Liriodendron tulipifera) are among their introductions. Tradescantias weedy nature perhaps wasn’t realised when botanists named it in their honour. For gardeners who encounter this weed, the Tradescants are unlikely to be forgotten. Footnote: This story was first published on December 9 in TasWeekend, the weekend supplement in The Mercury. Oxalis – wonder plant, or weed? Great article Jennifer! I went to the garden hoping to find oxalis for my Christmas salads this week but it is too hot for it up here now. I find it amazing that once you start eating the (edible!) weeds they seem to know they are under threat and are so much less of a problem plant. Having said that, oxalis is a lovely addition to a salad but you would not want it as the main ingredient!